Poisoned Pen Press, 9781464205194, 286pp. Chicago video producer Ellie Foreman has been absent from thriller author Libby Fischer Hellmann's repertoire for almost a decade. 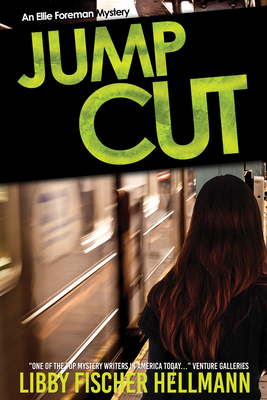 Now, in Jump Cut, she's back...and is soon to find herself entangled in a web of espionage, murder, and suspicion that threatens to destroy what she holds most dear. Hired to produce a candy-floss profile of Chicago-based aviation giant Delcroft, Ellie is dismayed when company VP Charlotte Hollander trashes the production and cancels the project. Ellie believes Hollander was spooked by shots of a specific man in the video footage. But when Ellie arranges to meet the man to find out why, he is killed by a subway train before they can talk. In the confusion, she finds a seemingly abandoned pack of cigarettes with a flash drive inside that belonged to the now-dead man. Ellie gets the drive's contents decrypted, but before long discovers she's under surveillance. Suspecting Delcroft and the ambitious Hollander are behind it, she's unconvinced when Hollander tells her the dead man was a Chinese spy. Ellie and her boyfriend, Luke, try to find answers, but they don't realize how far they have ventured into the dangerous echelons of hidden power. When Ellie's daughter is kidnapped and Charlotte Hollander disappears, it becomes terrifyingly clear that Ellie is in way over her head, and more lives are on the line--including her own.